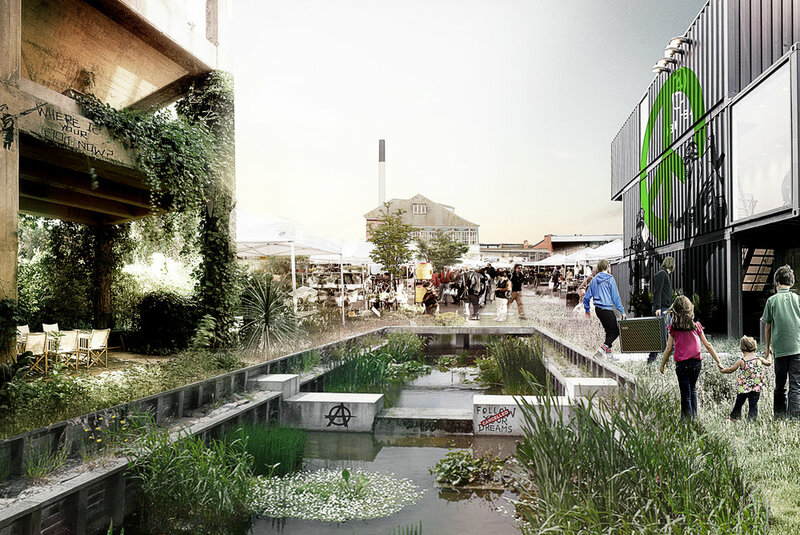 The ambition of project DK2050 for Danish Architecture Centre is to create an informed national debate on how we create a sustainable society and urban life in 2050. DK2050 discusses the possible futures and directions for the Danish cities and regions, and sets up scenarios for a future healthy and sustainable environment in Denmark. What are the future opportunities and today’s actions? The project tries to develop how the different cities could look and work in a scenario where the green initiatives are sporadic and diverse. DK2050 describes four possible scenarios for how the transition towards a more sustainable Denmark free of fossil fuels could look like in 2050. WE Architecture was chosen to work with the scenario Green Guerilla. Green Guerilla describes a Denmark where green initiatives are made by bottom-up initiatives and subcultures revolting against a Denmark that is only focused on growth through profit. DK2050 is an ambitious project bringing together ten municipalities, four ministries, three regions, foundations such as Realdania and private companies around the green transition in Denmark towards 2050. The Green Guerilla movement focuses on using the natural resources and exploiting new technology for a green purpose. The project focuses on four different cities: Copenhagen, Aarhus, Høje Taastrup and Sønderborg. Each city is facing different challenges in the Green Guerilla scenario. Some cities have turned the focus on green initiatives into positive attributes whilst some cities have fallen short because of the heavy urbanisation that has occurred during the last 35 years. WE Architecture based the initial research on a series of topics that were thought logical for the projection of the scenario Green Guerilla. Each topic was shown in a timeline based on past (1st industrial revolution), present (2nd industrial revolution) and future (3rd industrial revolution). By mapping the different topics and the evolution it was possible to draw a graph of how the development of each city towards 2050 could look like. The graph shows how the different cities would develop differently in the scenario Green Guerilla.